This month, Diane Swanzey, a longtime volunteer in the Docent program at the Art Gallery of Nova Scotia, was recognized by the province and municipality with two volunteer awards. On April 9, 2018, Diane received a Provincial Volunteer Award at a ceremony presided over by The Honourable Arthur J. Leblanc, Lieutenant Governor of Nova Scotia, The Honourable Stephen McNeil, Premier of Nova Scotia, and The Honourable Leo Glavine, Minister of Communities, Culture and Heritage. A few days later on April 12, 2018, she received a Halifax Volunteer Award, which was awarded by Mayor Mike Savage and District 16 Councillor Tim Outhit. These two awards honour Diane’s commitment and dedication to giving back to her communities through volunteer work with the Art Gallery of Nova Scotia, the Immigrant Services Association of Nova Scotia, the Dartmouth Literacy Network, the YMCA Centre for Immigrant Services, the English Language Learning Program through the Halifax Public Libraries, and the Waverley Heritage Society. The Gallery extends heartfelt congratulations to Diane for this prestigious recognition of her contributions. I have so much joy when bringing art to students and adults alike, that it has filled my life with pleasure, and I hope brought fun to their lives as well. The Art Gallery of Nova Scotia’s Docent program originated during the years when the Gallery operated out of the Citadel and Alice Hoskins was head of education. At that time, the volunteers in the program were called guides, which differs from how we refer to the two groups that facilitate our touring programs today. 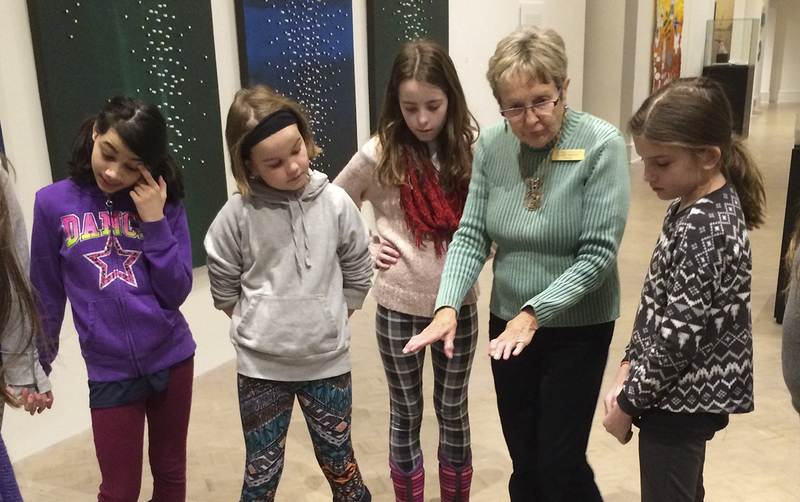 Docents lead school groups on tours through the Gallery and are trained using specific methods for engaging learners of all ages. Guides provide daily public tours in the Gallery, interpreting the collections and exhibitions to visitors from around the world. Diane has a commitment and passion for causes that enlighten and enrich the lives of youth and new immigrants and refugees. Her volunteer work reaches these groups on an individual level: in one-on-one settings or small group tutoring sessions, and through her participation in volunteer committees and groups. The impact of this work is immeasurable, as is evident through feedback the Gallery has received from her school tour groups over the years. Through her long-standing role as a volunteer docent at the Art Gallery of Nova Scotia - the longest in the Gallery's history - she has impacted thousands of school children, opening them to new ideas and ways of seeing, and no doubt providing them with an experience that extended well beyond their visit. Thank you, Diane, for your dedication and for advocating on behalf of Nova Scotia’s school children. DIane Swanzey with students during a visit by Ecole Truro.